The other art show that I attended last week at the Saint Louis Art Museum was entitled, Degas, Impressionism & the Paris Millinery Trade. Open through May, this is the big show at the Slammer for the first part of this year. 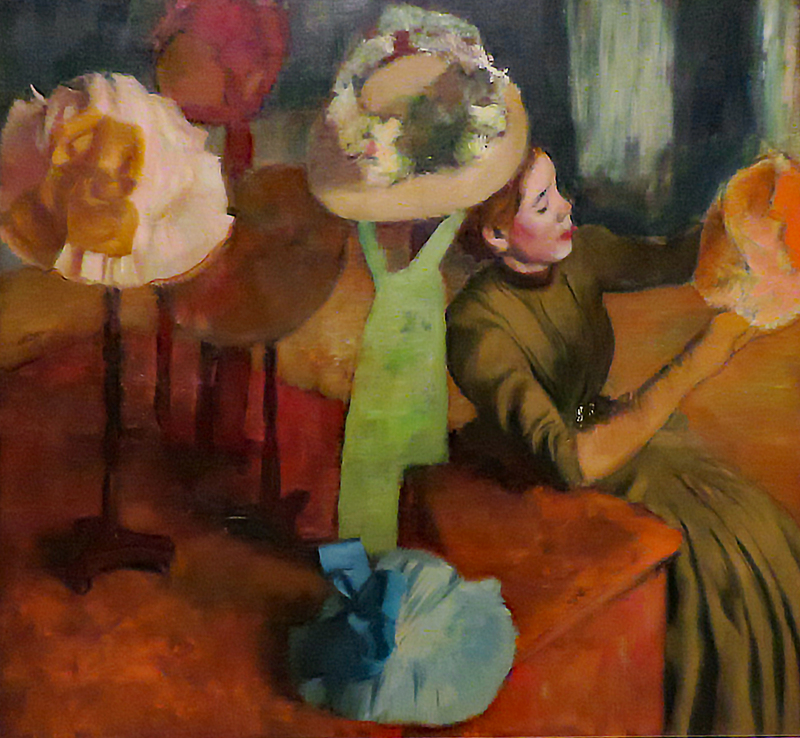 Edgar Degas had a fascination with Paris, high-fashion hats and the young women who made them. This show features an array of period hats and some sixty artworks that portray Paris fashion and the industry and people who created these fashions. In addition to Degas, other artists that are featured include Manet and Lautrec. While we were watching the Oscars last night, we got a surprise. No, not that best picture envelope mishap, but rather notice that Bob, our longtime friend from Rochester, NY was about to drop in on us. As it turns out, he had notified us about his arrival a couple of weeks ago. Bob had sent us an email, but our email account is a bit of a mess, what with countless spam-like emails appearing everyday, his message as they say got lost in the mail. We missed it and were left unprepared, without any Ted Drewes to offer him and what was even worse no beer either. The beauty of long friendships though is that a little faux pas like this can sometimes be overlooked. We promised him to make good on our error the next time, assuming that we are given a second chance. Bob came back tonight. We went out to dinner with him, to Salt & Smoke, a BBQ place in the Loop. It was all good. It was good to be able to spend some more time with him. It sounded like his business here in town went well. I hope that it leads to more repeat business, because we would like to see him again. This entry was posted in Art, Life, Photo, Photography, Saint Louis, Saint Louis Art Museum and tagged Degas Impressionism & the Paris Millinery Trade, Edgar Degas by RegenAxe. Bookmark the permalink.